This is a really flavorful sauce that could be the foundation for a zillion variations. Try tofu or a chicken substitute instead of tempeh. Add some shitake mushrooms. Use brown or white rice instead of soba noodles. 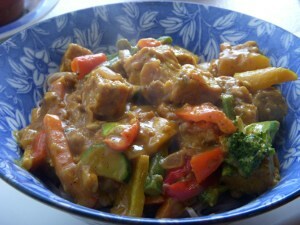 Omit the curry powder and just enjoy the peanut sauce. 1. In a medium-size pot over medium heat, whisk together the sauce ingredients. Heat to boiling, stirring constantly, making sure all peanut butter and miso lumps are dissolved. Remove from heat and set aside. 2. Fill a pot with water and bring to boil for soba noodles. Cook according to package directions. 3. Heat the oil over medium heat in a wok or heavy skillet. Add the garlic, onion, bell peppers, and tempeh. Stir fry for about 5 minutes. Add the zucchini and frozen veggies and continue to stir fry until the vegetables are just tender. Stir in the peanut sauce; heat tempeh and veggies until simmering. Remove from heat and serve over soba noodles. Enter your email address to follow ethnic vegan and receive notifications of new posts by email.